Samuel Friedrich Christian Kirchner was the first son of Georg Andreas Kirchner and Christiane Caroline Margarethe nee Schweizer. He was born 2 October 1829 at home in the Inn and Bakery "Zum Rössle", High Street, in the little village of Kochendorf, Bad Friedricshall, Württemberg, Germany. His father Georg was a baker and innkeeper. 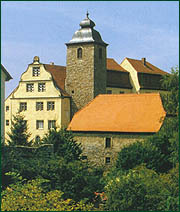 The present town of Bad Friedricshall arose in 1933 from three villages - Kochendorf, Jagstfeld and Hagenbach. 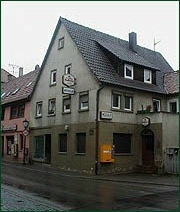 It is possible that the "Zum Rössle" building may have been the town hall of the former village Kochendorf. 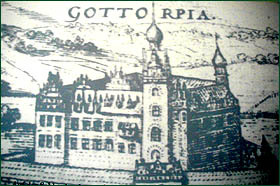 It was built in 1597. 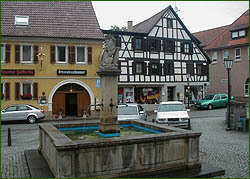 The name Kochendorf comes from the Kocher River and 'dorf' (village). Neckar and Jagst were other rivers close by. Dennis and I visited Germany in 1997 and as we left the autobahn and approached Kochendorf, what a thrill it was to finally see the name signposted - all those years of reading about the village which had been here for so long, now we, also, were here! The river carries enormous barges laden with salt taken from the ancient salt mines, which are still worked today. 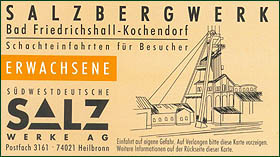 There are miles of tunnels connecting neighbouring Heilbronn to Kochendorf, the construction of which we were told was a cheaper alternative to building and installing a second lift, for safety reasaons, in the Kochendorf mine. One part of the enormous mine is now used for chamber concerts, while a large area which is depleted of valuable salt, is set up as a museum. We were intrigued to see a display relating the story of "Saint Barbara", the patron saint of miners! There were piles of salt to rummage through for a souvenir, the ground was in places damp, but mainly the atmosphere was quite enjoyable. We were shown an exhibit depicting many of the art and religious treasures and artifacts that had been stored out of harm's way by Hitler during World War II, and later we saw a beautiful fretwork frieze in a Church in Heilbronn that had been saved from destruction in this way. We had the honour of taking morning tea with the Mayor of Kochendorf, and he presented us with a book about the village, and a little bag of Kochendorf SALZ (salt). We also met the archivist who had done a lot of the Kirchner research - he showed us through the archives, let me look at some old Kirchner material, and scared the daylights out of me by directing me to a filing cabinet drawer, which, when I peered in, was full of human skulls and bones!!! We were made so welcome by our newly-met relatives, they spared no effort in showing us all around their beautiful area. We saw so many castles - amongst them the fairytale turrets of Hohenzollern - visited Lichtenstein Castle, Schwetzingen Castle with the asparagus stalls outside the ornate gilded gates, and Heidelberg Castle of "Student Prince" fame. We met their extended family, had a picnic amongst the trees of the forest, sampled Swabian food, even spent a few days monitoring the never changing pattern of the nesting bluebirds and their new babies in their apple tree. In short, they spoiled us and it was a wonderful experience to meet them and share their life for a week. The relationship between myself and Emme and Helmut lies in the family of Emme. Her 3rd great grandfather Johann Matthes Kirchner was the brother of my 3rd great grandfather Christian Mathaus, therefore we are both descended in exactly the same way from their father - Andreas - our 4th great grandfather! Samuel Friedrich Christian had eleven known siblings. Friedrich born 1822, Sophia 1824, Johanna 1826, Christian 1828, Carl 1831, Schorsch (George) 1834, Elizabetha 1837, Carolina 1839, Catherina 1840, Wilhelm 1842 and August born in 1844. Brothers Carl and Wilhelm went to live in America. These details are from a researcher in Kochendorf and have not been carried any further. In the mid 1800's many German people came to Australia and a number of Kochendorf inhabitants were amongst them. A newspaper article documents names, destinations and snippets of information on the various people who left the village. A translation of part of the newspaper article states "Samuel Kirchner, born in 1829 and his wife Catherina (sic) Knapp found employment in a village near Sydney. He worked as a gardener. Everything he heard about the voyage and the conditions in New South Wales he could attest in his letters. He earned very good, much better than in Kochendorf before. Soon after his arrival his both sons Schorsch and Schani are born in 1857 and 1858". The town of Kochendorf has quite a collection of memorabilia regarding villagers who left for other countries, and in the Town Hall (Rat Haus) there are originals of the two letters written by Samuel back to his family, dated 1858 and 1859. Samuel was married just prior to leaving for Australia. Friederike Catherina was born 4 July 1829 in Kreuzle, Weinsberg, Neckar, Württemberg, Germany to Georg Friedrich Knapp and Catharine Margarethe nee Maier. Her father was a Händler - dealer or trader. Neckar is the name of the river that flows through the Neckar Valley where the village of Kochendorf is situated. It's a very picturesque spot, with terraced vineyards sloping down to the gleaming water. Many boats ply the waterway including the salt barges, enormous cruise boats and all sorts of pleasure craft. 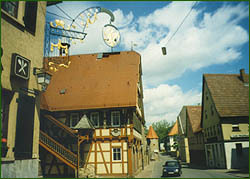 Kochendorf is a maze of winding, narrow streets and old buildings decorated with gold gilded turrets and decorative painted signs. Before leaving the Fatherland, twenty-eight year old Samuel signed a "Severance of Loyalty to the King of Württemburg" document - no turning back! 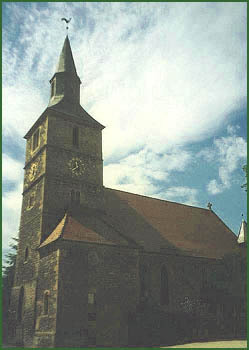 Samuel and Friederike were married 3 May 1857 in Sebastianskirche, Kochendorf. In a letter Samuel wrote home to his family he mentioned how someone back home had "laughed and mocked his wife about the village" - most probably as Friederike was quite pregnant, their son Schorsch (George) being born on the voyage. They came to Australia aboard the "GOTTORP" which left from Bremen, Germany and arrived in Sydney 15 September 1857 under Captain Barneldt. She had left Germany 21 May and brought 259 immigrants. The Ship's surgeon was Dr F Jager, Kirchner and Co. were the Ship's Agents in Sydney. This would relate to Wilhelm Kirchner, also from Kochendorf, who became Consul for Prussia in Australia, and was instrumental in starting the 'bounty' scheme to bring German workers to settle in Australia. The "GOTTORP" was a 'full rigged' ship having three masts with square sails. Gottorp is unusual for a German name, it seems odd that it ends in "orp". Having only seen the name in Australian documents, maybe it should be Gottorf. Not far from Bremen in Schleswig, is "Gottorf Castle", home of the family who ruled Russia in the 18th century. 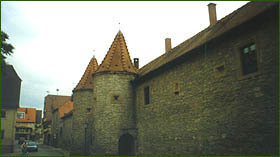 The castle is now a museum. My great grandfather was naturalised 8 June 1861 and was then living in Ashfield, Sydney. Upon arrival he obtained work as a gardener where he was amazed by the variety and abundance of flowers, fruit and vegetables in the new country. He tells of his wonderful new life and how happy his little family is in letters back home to Germany. The original letters are written in old German but luckily have been translated into English, when and by whom is not known. The content is reproduced below - spelling and grammar are as received by me. The first letter was sent in September 1858, the second in August 1859. The letter written in August appears to have been done in stages, with a number of Dear Siblings salutations throughout. Hope you all will be as well as we left you. Cousin George brought the letter, august 30th, to which we have been waiting long time. We didn't believe, that God will recall our father so soon. But, to know him in heaven, where sun is shining everytime and no lamentation will be, will take consule on us. Over there we will find him and we will reunite. You may be sure, we are very sorry about the death of our father, as sorry as we would be at home. Especially we are verry sorry, because we intendet to take pleasure to him by sending some money. (5M = 60 f). For the three little brothers and sisters we would also send something. The letter should arrive just at Christmas time. We would write in it, father shall drink some good wine of that money. Unfortunately it is too late now. We have to console with the thought, that it was the will of Good God. Just to the three little ones it will be most difficult. So, we hope, you will be responsible, that they are not alone. We also will do for them, all we can, even though we are in a foreign country. We don't forget them. You have written, I have to get some fortune for heir. I would be happy, if you had written, how much I have to get. Probably you have believed, I would claim it. Oh, don't believe it, we think, you need it more, and we would be glad, everyone of you would have much of the fortune. But I am telling you, each of the three little ones has to get 4 f more. You have to give it to them for going shopping, something they want. I hope, you will fulfill my wish. Dear Sofie, you are asking for an authority, but if you may divide without an authority of me, I would like it more. I have asked after the costs of it, and it would be about 36 f = 3 M. If you can't divide, you have to write me, how much I have to get, because I have to specify it. You also asked for my job. I'm working in a beautiful garden, which is about 4-6 acres with many fruit-trees, lemons, figs, many kinds of fruits you don't know; various flowers, much roses, they are not to count. They are blooming the whole year, because there is no winter in this country. The weather is just like in harvest in Germany. We are also cultivating all kinds of vegetables, potatoes, cabbage, beans and peas. In the stockyard there are hens, ducks, gees, goats and dogs. Also much horses, I can't count them. I can't tell you the number of acres of the farm, but it must be more than the area of Kochendorf. My boss don't know his prosperity. Dear siblings, now I am telling you about me. I have worked now about 2 years for my boss and earned 40 M a year. One M is 12 f here. You see, we are earning more money than in Germany, and my wife has not to work. I also got some ground to plant potatoes, cabbage, peas and carrots. In front of the house, we have a beautiful flower-garden. For payment in kind we have every week 20 pounds of meat, 20 pounds of flour, 4 pounds sugar and 2 pounds coffee. We are not short in foodstuffs. When I have been with my boss for about 8 or 10 weeks, he made me a present of 18 f. So you will see, we are very well. We are healthy and strong, happy and satisfied. You should see our little child, it is so nice. I'm sure, you would like it, if you could hear it calling 'Mam and Dad'. He always wants to go outdoors and is calling 'ada' (that means in German children vocabulary: Let's go for a walk.). He is walking now, when he may hold himself at something. We are living in a house about a quarter of an hour away from the farm I am working; there are 4 houses near by and it is about 100 steps to the village Petersham. It is more beautiful than Jagstfeld and we can buy there all we need. Half an hour or more is a village ........(illegible) and another half an hour the town Sydney, where we have landed. It is a beautiful town. You don't believe the beauty of the stores, there is no one in Germany. Dear Siblings, please tell the parents and sisters of our cousin George about that I have written of here. Recently a gold-mine was discovered, named 'The Word of God'. It is about 200 hours from here. 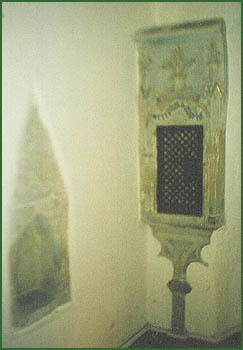 Thousands went to that place. Even all the sailors of a ship went to the mine, only the captain remained at the ship. Cousin George also did so, otherwise he would have written a letter and sent some money for his parents. But he told us, if his luck will be in and he will keep healthy, will write them very soon. He will tell us, if digging is successful. In my next letter something more of us, that dear brother Christian and Georges brother Christian may make up their minds. If somebody here is working like in Germany, way of life is much better. Working time is from 6 am to 6 pm. There is a break from 8 to 9 am, and from 1 to 2 pm. That is 10 hours working. Everything, we are writing, is true and everybody has his own free will. Just the voyage is very troublesome. Some passengers are healthy and strong, some sick. We also have been sickly. If I have to give an authority about the heir, you should send me a printed form, and you have to put a stamp to the letter, otherwise it will not arrive to us. Greetings to you, our cousin, his parents and sisters. Petersham, Aug. 10 th 1859. Received your letter dated June 12 th. We have enjoyed to read it. Espacially we are very glad to hear, that you all are very well. Dear siblings, it is now 9 month ago, we have written our letter. We do not know, why you did not answer for it. We can't believe that are so much troubles about the heir, that you could not write. Dear sister Sophie, you have been writing, that ........(name illegibel) wants part of the money, but we don't know why. Perhaps for looking for our brother Friedrich and our father. Bevor we left she laught and mocked about my wife in the whole village. We can not forget it. She shall have nothing of the heir, because she is a reach wife and should be ashemed	inorder to taking money of us. If we would have given her something, we had written it in our first letter. Dear siblings, the money of the heir of our father that belongs to me, I want to give to my sisters Sophie, Katharina, Elisabeth, Marie and my brothers Christian, Schorsch (Georg), Wilhelm and August. Nobody else has to get heir of our father. Dear sister Sophie, you have written, you will have a merry day after dividing the heir, and you have invited us to that banquet. We will be with you. We hope you will be cheerful and drink on our health. We wish you will have this day of rejoicing with foster-father Sonnenwird. Greetings to him and his wife. Many thanks for them for all they have done to us. Dear brother-in-law Jakob, you like to drink a glas of wine. In this country wine is very strong, so, if you will drink a pint of it, you will not see the ground any more. We would wish, that you would have 2 - 3 glasses of it, and we liked to see how merry you are. A glas costs about 36 x (illegible). All kinds of drinks are very strong. We thank you very much for writting dear Jakob. We thought, you have forgotten about us like our brother Christian and Schorsch did. They may think like the wealthy man in a fairy-tail. The first may have bought a pair of oxen and have to look for them; and the other one may have married a wife, and therefor also has no time. We have looked for some words in the letter, but we didn't find anything about our brothers. We are very glad to hear from you, dear sister Katharina and about sending a curl of your dear children. It will be a memory to us and we framed it and hung it to the wall. We are also glad bout your rhymes, dear sister Elisabeth and Marie. We are also sending a picture to you for memory. You will see us and our children very well. You can even see my wart at my forehead. You see Schorsch (Georg) is praying and our dear little Shani is just awaken from sleep. He is half a year old, and didn't have any firm food nor an comforter now, only mother's milk. You can see him very strong. We wear a costume of this country. Your brother Samuel is talking to you: "Don't be afraid, because I have a strong beard." I don't live in wilderness, it is fashion in this country to have a beard. Cousin Schorsch has the same one. I can tell you, Samuel is more funny and pleasured than former, sings and whistles all day long. He says, he will enjoy his unmarried time, because he could not do that in Germany. We are very well, healthy and have pleasure with our 2 children. We would like to have you here or near by. Dear Siblings, if you would have, we wish you to have, you would have enaugh meat and other foods, because we are not short in it. Sometimes we have 30-40 pounds of meat a week, we could not eat it. The bread is as good and fine as the cakes in Germany. In Germany they say, letters will be opened and everybody has to write well about Australia. That is not true, everybody can write whether he is well or not. The picture enclosed belongs to you, dear sisters Sophie and Elisabeth together. Please honour it, because it costs 36 f and we hope you will take pleasure in it. Dear sister Sophie, you have written about the two brothers Wilhelm and August, that they are not so well, we are sorry for them. With the help of God they will have a better time. Wilhelm, don't despair, beat that Jack Keifer, God will help you. Dear Sibling, we are wishing to help them, because they lost our father so early, and don't leave them alone. Now I will finish this letter with thousands of greetings to all friends, relatives and all they ask for us. We hope you will write again as soon as possible, that we are feeling well again. Very speedy replay. Samuel and Friederike's second son Schani (Johann) was born 1858 but died in 1859. John was born in 1860 followed by a sister Maria Chaterina on 30 August 1862. Chaterina is possibly Catherina mis-spelled, this is how it appears on her birth certificate. Some time before the death of his first wife, Samuel was working as a gardener on a large property at Petersham, a market garden or farm. He built a home at 23 John Street, Ashfield, Sydney and named it Württemberg Cottage. The large block of land was very good, and later on included fruit trees and fowl house plus a tennis court. In 1917 street re-numbering took place, at which time the address became No. 34. Speed the Plough by Sheena and Robert Coupe, is a book with much detail on the Ashfield area of Sydney. It was released for the city's centenary. The book mentions 'Hermitage Farm' - possibly where Samuel may have been employed as a gardener. Sadly Friederike's life in the new country came to an end when she died 27 December 1863. She was buried 29 December 1863 Parish of Camperdown, County of Cumberland, Sydney, NSW. A large area of this cemetery has been resumed, and her actual gravesite is unknown. NOTE: Finding information on Friederike's death had proved impossible until finally I managed to locate it under the name of FREDERICK A KERCHNER..... I have left edited information on www.ancestry.com.au website in the hope that others may realise why her death and burial details are not easily accessible.